Do you need to use run training plans? As a beginner I would say it really is not necessary to follow a training plan unless you have a specific goal in mind or need the structure of a plan. In the early days, a beginner should focus more on getting their body used to running and just enjoying it with no pressure. However there may well come a point when you want to train say for a 5K, 10K or longer race, or perhaps you want to lose weight or to get faster or maybe you are someone that likes the reassurance of a structured plan. That's when a run training plan might be really useful. Should you just grab a free training plan off the internet? Can you use the same plan that your friend uses? What should you look for in a run training plan? Set yourself a goal. By knowing what you want to achieve, you can then decide on what training plan you need. Be realistic on what you want to achieve. Can you really run a 10km at the same pace as you did 30 years ago? Decide your running level and experience. A BEGINNER marathon training plan is not necessarily suitable for a BEGINNER runner who has never run before. Research LOTS of training plans. Lots are free and some of them are very good. The ones you need to pay for are usually not available to see online so get recommendations. Trawl running forums and ask questions. Some plans have you running everyday - do you have the time to do that? Some plans have your running by time rather than mileage - this is my preferred option as it takes into account your capabilities. Some plans prescribe running paces and race prediction times - decide if that is important to you. 6. Be adaptable and not a slave to your training plan. They are not set in stone. Adapt it if you feel it necessary - add in an extra rest day, replace a run with cross training. You might also want to jiggle the days round a bit but remember not to place 2 hard work out days next to each other. If in doubt, be more cautious rather than overzealous. 7. Consider using a personal coach if you can't find a training plan that suits you. You might find a coach at your local running club or try online coaching although that will not be free. 8. Don't neglect strength training, especially us older runners. Strength training is a way of reducing your injury risk. It can be a real nuisance to do but try and find time to do 15 minutes at least twice a week. Here are some simple but effective strength training ideas. If you do an internet search for couch to 5k training plan, you will be spoiled for choice. Some will be free and others you will have to pay for. Browse running forums and get reviews from other runners before you commit to anything and then pick a plan that suits you, taking into account all the factors above. If you are like me and like having a book which you can stick sticky notes in and reference pages, then I recommend Mat Fitzgeralds 80/20 Training. It is an easy read but with lots of great information about how our body reacts to running plus there are training plans from 5k to marathon distance. 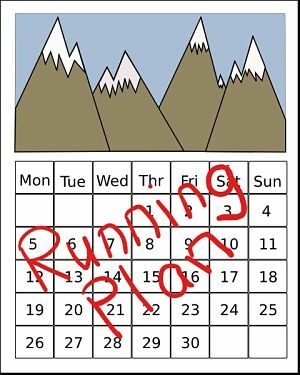 My first run training plan that I used was when I was preparing for my first marathon. I found recommandations on running forums and was steered in the direction of the plan of two very reputable trainers. Armed with great recommandations and bags of enthusiasm, I bought the book and started off on the "Beginners Plan". I had been running for about 4 years by then but I was a rookie marathoner so caution told me to start at the beginners level. In the first 8 weeks, everything went great. I followed all the instructions and come what may I followed each training run to the letter, sticking to the prescribed paces and distances. I felt good and proud of myself. By week 9, The weekly mileage had taken a huge leap compared to the start and I started to notice a niggling knee pain. Keen to press on, I ignored it. By week 10, I worried with each run as the pain got worse and I started to limp. Not good. By week 11, I was officially injured. I had to give up training and give up my dreams of running a marathon. I had to stop all running for 5 weeks. So what went wrong and why did the beginner training plan not work for me as a beginner? I hate to blame the plan but in essence it was the "wrong plan" for me. Yes I was a beginner but the high ramping up of mileage was just too much for my body. Cookie cutter plans don't account for age or other physical issues or even what your goal plan is. The only thing on my radar was the marathon training runs. I didn't take into account dietary needs, sleep needs, rest day needs and consequently my body finally said "ENOUGH"! This time round and a year later, I was wiser. I needed a plan that took into account my age, my running history, my goals, previous injuries, time available to train and so on. The only way to get that was to have someone devise a plan for me. Again through recomendations on forums, I found a young trainer who was strronlgy focused on injury prevention whilst getting you to your goals. My goal was to finish a marthon - no particular time but under 5 hours would be nice. My training experience was worlds apart from first time round.The trainer sent me a questionnaire which took into account everything from age, injuries, time, experience, to expectations and so on. The plan he created was much more doable to me and more focused on "me". There was also a lot of strength training sessions built in too which although I hated at the time, they did the trick in stopping my knee injury recurring. Everything was organised through emails as he lived in the US and I was in France. It was great though to know that I could send a message if I had an issue or if I just needed reassurance. I remember panicking that I couldn't imagine running for so long on marathon day having never done it in training. My trainer reassured me that I had completed the training and that on race day I would experience "race day magic". He was so right. I ran my first marathon at the age of 53 in a time of 4:12. Hopefully you will find the perfect training plan for you and if you need a bit of advice, feel free to ask me a question.